Bernds a folding bicycle maufacturer offers a Speedhub with belt drivetrain. Living with the Rohloff Speedhub: The article is the best resource I found about the Speedhub. Very detailed! The article also mentions the max. input torque for the hub. This is important to define the starting point of the 526% overall gear ratio! Please check the Rohloff Homepage there are all necessary documents stored and easy to find! I have a Rohloff speedhub nowe, for quite a couple of years. Surprisingly, you can feel the high efficiency of this hub. But to be honest, I am not so happy. First, when I instaled it on my Flevobike, very often after changing gears, the hub switched to “no gear”, free running pedals without power to the wheel. There is only one type of “lever” available for changing gears. The force to change gears is relatively high. Sweatting a lot I failed to change gears when I needed it most, my hand, wet from sweat slid several times around the lever, until, after a few attempts, I changed two gears instead of one. Very often, after changing gears, I need to play the lever until the wished gear is engaged. It is fascinating to be able to switch all gears with one lever, even when standing. But changing gears does not work that reliable. One would expect a good working equipment for that price. Toxoholics.de do sell via mail order. I purchased my shifter from BikeComponents.de along with some other Rohloff parts that I wanted. Good luck. This aftermarket shifter will do what I think you want to do and it is a well made piece of equipment. WHERE CAN I ORDER THIS SHIFTER?????????????? Where can I find a tech manual in english? I have a Rohloff and I love its convenience, but the above statement simply isn’t true. A derailleur drivetrain consists of one chainring and one sprocket. A Rohloff drivetrain consists of a chainring, a sprocket and one or more sun/planet gear combinations. The meshing losses, plus the small amount of loss associated with friction of lubricants and seals mean less efficiency than a derailleur. The Rohloff is without doubt an engineering meisterwerk, but it is still a hub gear. And hub gears may be more convenient to use, be more reliable long term, and long term, cost less to run. But they are still less efficient than derailleurs. derailleurs lose efficiency when sprockets <= 12 teeth are employed, and due to the convolutions throughthe tensioner, but mainly you're quite right. The only credible independent efficiency measurements I've seen actually give best results to an old oil lubricated sturmey archer(!) – hpva rag a few years back. The rohloff was in the 90's and its best efficiency wasn't gear 8, I think it was gear 11. I don't think any of them give good efficiency data – it is, after all, quite difficult to prove them wrong…. We have hub number 003, which has nev er yet been built into a wheel, but we are going to incorporate in into a ike very shortly. I hope it still works after all these years! Incidentally, it came our way because it was the hub which was sent to Encycleopedia for photography purposes, when the Rohloff was launched. It was passed to a mechanic as payment for something, and when he retired, we bought all his shop stock. A year later, he found the Speedhub, so he gave it to Berine for her christmas present! hi folks,i am a very happy rohloff user looking for riser bars to fit the R shifter ( 22.2 dia ). they seem to be a rare species indeed,any thoughts out there ? The new importer of Rohloff hubs for the USA is QBP, the largest bike parts distributor in the US. They are also the owners of Surly, Salsa and Civia bicycles. The warranty and factory authorized USA service center is Cycle Monkey in Albany, California. 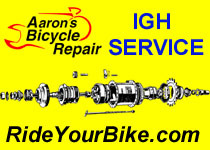 Click on my name above to visit the Yahoo Geared Hub Bikes group which supports all IGH makes and models. In response to the prior poster who indicated hard shifting Rohloff offers a softer detent option though it apparently requires hub return to the factory or a service center for installation. Also if the cables are set with no play at all shifting will be harder per the manual. The English language version of the manual is available on the Rohloff web site as three PDF files. No one has yet developed a drop bar shifter for the Rohloff due to technical challenges apparently. The Rohloff uses a dual cable pull-pull shift cable arrangement and total cable pull in one direction for a full range shift is over 9 centimeters or almost 4 inches. Total derailleur cable pull for most rear derailleurs is about 2cm. I suspect that a drop bar combined brake shifter will require some original thinking for the designer or Rohloff redesigning the hub portion of the shifting mechanism. There is a maker of electronic shifters for Rohloff in Melbourne, Australia. Good quality, and over 50000 shifts on one charge. The twist grip is ok but as some have said can be uncomfortable and stiff to use. Motorcycles use a sequential gear shift that turns a selector shaft in steps. The shift lever moves the shaft to its next detent (up or down) and the lever returns to the mid position. A self centering lever with detent action could be used to pull the Rohloff cables. Someone please fire up the CAD computer. to mount on down tube bosses , of drop bar bikes . on my Trekking Bars, with out issues ..
under a drizzle and 20 knot headwind. thar Rohloff sells at a sky high price. ? 20 wt gear oil? 10w30? Using a different oil in the speedhub should work without problems. Years ago, when I bought my speedhub I was at Rohloff manufactory. That time they had a different oil for summer and winter. So, I asked what happens when I ride the speedhub in summer using winter oil. The answer was: Technically O.K., but the speedhub will develop more noise. That means there is a maximum of viscosity (thickness) allowed for the Speedhub. So, oil having the same viscosity as the original one should do. I think, using additives is also recommended. BTW, now R’off themselves offer a 36 hole hubshell . the casing split has 9 bolts, still 1 between every 2 spoke holes on the left side of the Hub ..
it is an eccentric offset, but does use the gap so the brake cable can pass underneath, through the shifter..
grip surface is by knurling . Berthoud of France, seems to have one too..
Phil Wood is making custom Rohloff shells. Any drilling you want! Here is a 36 spoke version. I think it is better looking than a Rohloff shell. We have been drilling out 32 hole shells to 48 for some years now. Had mine for 3 months. Downside: heavy, noisy,expensive, naff eagle emblazon spoils look of hub. Upside: Great ease of shifting stationary or moving. No filthy mess of deraileur contaption hanging off the back. Simple spoke geometry, clean and tidy. Net result: Very pleased indeed – highly recommended. blogger. I have joined your feed and look forward to in the hunt for extra of your wonderful post.